Recessions are actually great times to start businesses. Recession-time entrepreneurs have to be nimble, decisive, and quick learners; and by the time the recession is over, these entrepreneurs/businesses have a huge head start over everyone else who then realizes they should start a business. 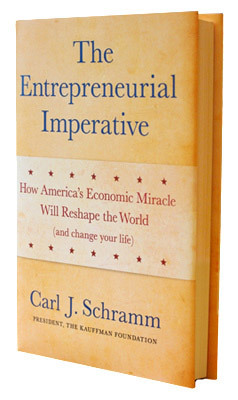 I’ve just started reading The Entrepreneurial Imperative: How America’s Economic Miracle Will Reshape the World. It’s a fascinating study on the power of entrepreneurship and how it’s our last important competitive advantage here in America. “Entrepreneurship alone — not anything else — can give America the necessary leverage to remain an economic superpower,” he says. I’m only only a few chapters into it, but it’s really been inspiring so far. If you’re going to start a business, good advice must be a top priority! It’s easy to jump in and make mistakes that will take years and lots of money to undo. Like your business name, for instance… Check with the Secretary of State to see if your business name idea has already been used and register the name to protect it from others using it. Holly got our business name “Prints Charming Photography” registered back in 1999 and I’m really glad she did because they seem to be popping up in every other state now. We only wish we’d have registered it nationally back then. I can imagine how confusing it would be if there were another Prints Charming in the OKC area. Some time back, I met with a mother/daughter team getting back into photography as a business and their name idea was “1000 Words Photography.” Yesterday I heard of another photographer starting up a business with the same name, so I did a search and found no fewer than four other businesses using the same name “1000 Words Photography.” It’s witty and I like that, but I can’t believe there are four! Ouch. Three or four of them are just begging to be sued and nobody wants to be a part of that. Seriously, here are the four I found in about 30 seconds… And I never did find the new startup, so there’s yet another one out there. They’re all completely different companies, owners, photographers and sites within about a 70 mile radius. It must be really confusing for people to find the right one. Here’s a link to a concise list of to do’s if you are thinking about starting a business, courtesy of the OK Dept. of Commerce. If you get overwhelmed easily over these kinds of to do’s, just have your accountant take care of them for you. Better to pay and have them done right than procrastinate and get yourself in trouble.